On April 20, 2010, the offshore Deepwater Horizon oil rig exploded which caused the worst oil spill in American history. I remember hearing all about it on the news and in school and watching the aftermath that almost destroyed an entire habitat of life. A lot of people don’t seem to be on board with making a movie about this tragedy so soon after it happened, but I’m on the side that it’s a good way to honor the people who lost their lives while also raising more attention for the people responsible and showing the viewer the terror of what happened on that rig. 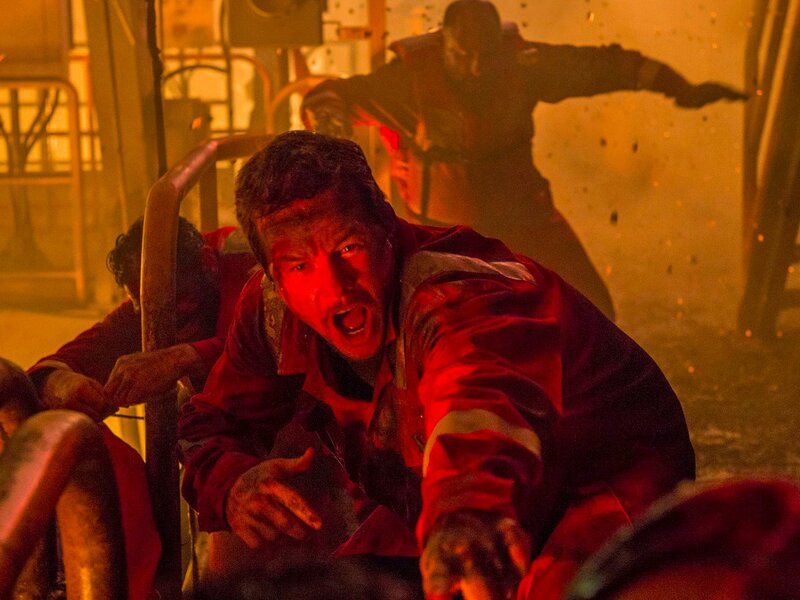 I wasn’t too thrilled with the trailers for Deepwater Horizon, so I had no intention of really liking this movie, and now after seeing it I have to say that it’s a stand out film of 2016. Mike Williams (Mark Wahlberg) seems to have it all. He has a loving wife, Felicia (Kate Hudson), a daughter, and a good, respectable job on the Deepwater Horizon offshore oil rig. At the start of one of his 3 week shifts on the rig, there’s some tension between his boss, Jimmy Harrell (Kurt Russell), and BP representative Donald Vidrine (John Malkovich) over how fast they can get started extracting the oil. What Harrell and the rest of the crew are trying to get Vidrine to understand is the unsafe level of pressure in the tubing that can’t exist when they start excavating. Vidrine finds the tests run to be acceptable and pushes the job to start. This leads to a massive oil eruption which leads to an explosion that engulfs the entire oil rig. With time running out, Williams and the rest of the crew begin fighting for their lives to get to the life boats and help anyone on the rig that they possibly can. Using words to summarize this movie really does no justice to how intense and thrilling Deepwater Horizon actually is. This is an expertly made film in so many different ways. 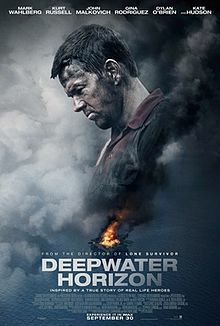 Peter Berg’s directing style gives the film a very personal feeling and the intelligent use of handheld camerawork often gives the illusion that you’re walking with these characters on the Deepwater Horizon. What really puts this movie over the edge and turns it into a technical wonder is the sound design and visual effects. When the rig finally explodes the combination of the special effects and booming sound made my jaw drop. It was a wonder to look at, but never is anything over done. The goal of this movie obviously wasn’t to wow the audience with its technical achievements, but to create a realistic environment of terror and destruction to illustrate the danger these workers faced around ever corner. When Oscar season rolls around, I expect to see this film nominated for special effects and sound because it’s just outstanding work. One of the strengths of Deepwater Horizon is the realistic portrayal of the characters and how they succeed at getting the audience to relate to them easily. Mark Wahlberg gives a good performance as Mike Williams, and I’ll go on record saying that these types of roles are basically meant for him at this point. He’s great as playing a sort of everyman family guy that is thrown into situations he may be unprepared for. I also have to give major props to Kurt Russell, who I believe gives the best performance of this movie. I felt like I knew this guy, and that’s exactly what I’m trying to say about the characters being relatable. Finally, John Malkovich steals every scene he’s in as the BP executive that is just so easy to hate. Anyone who’s worked in a corporate company knows how off putting “corporate” folks can be, and seeing him manipulate and and put unreasonable pressure on the workers in this movie was infuriating. It’s hard to call him a villain in this movie, but a lot of his action and motivations can only be described as villainous. The only possible fault I can give this movie is its pushing of a certain agenda. I understand that movies exist partially so film makers can have a voice and express their thoughts and beliefs, but when a movie has an agenda that is so clear and pushed so hard, it can become annoying. That’s mainly why I can’t really get into the work of Oliver Stone. This film is nowhere near as guilty as something like American Sniper, but it does have its moments where I felt like Berg was preaching to me and laying his beliefs on pretty strong in that obnoxious kind of way. The strange thing is that I agree with a lot of what this movie is trying to say, but some of it didn’t have to be done in such a heavy handed way. These are just a few instances, and overall I think it was handled pretty well. I really wasn’t to keen on seeing this movie, but I’m so happy I did. Deepwater Horizon is an extremely intense movie that is a technical marvel and bolsters some pretty good performances. While it does push certain ideas pretty hard, it rarely gets bogged down in what it’s trying to say and it works best as a testament to the bravery and strength that can be latent in everyday human beings. This is an exhausting movie that will make you feel that you just got whacked with a sledgehammer, but it’s a film that shouldn’t be missed.